Luscious, dark and creamy to perfection! All that with all of 3 ingredients – no need for added sugar, and of course no cream! I serve these individually in little expresso cups for a holiday party and they are absolutely BEAUTIFUL! The only issue is keeping them cold for the evening so I leave it to you to work that out but definitely worth it– a classic dessert! I have created an equally luscious vegan version here! Tip: Actually serves 9 if using little cups or expresso cups. It's perfect for a beautiful display on a banquet table. Break chocolate into big pieces in a microwavable bowl and add skim milk. Place in microwave oven on high for 30 seconds (not a second more or it can “burn”). Stir well so that the melted chocolate is smooth. Let cool for a couple minutes. Place the egg yolks, one at a time, into the melted chocolate stirring thoroughly between each. Place the egg whites in the bowl of an electric mixer and beat until white peaks form. Gently fold into the chocolate/egg yolk mixture. 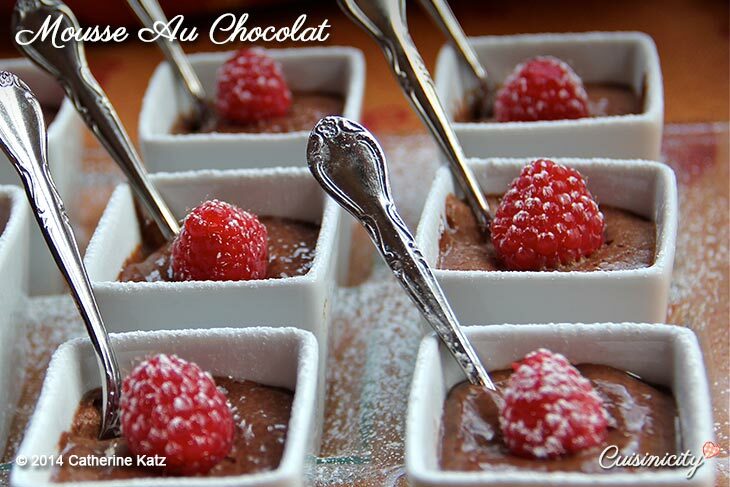 Place the chocolate mousse in individual little cups and refrigerate for at least 2 hours before serving. This looks mouthwatering. I think I will try it tomorrow. Here’s a question though – can I use soy milk instead of skim milk? will that give the same result. I would like to make this but can’t help wondering if this is safe when the eggs aren’t actually cooked? I personally only use eggs from a local farm and have never had a problem but if you are at all worried about it, you can use pasteurized eggs which will keep it safe. Alternatively, I have a delightful crème au chocolat (you’ll find it featured on my home page today) which uses no eggs at all and is absolutely delicious and reminiscent of this mousse. What a wonderful recipes, !! 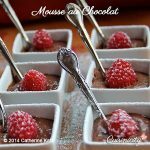 I Love the Chocolate mousse , look delicious and easy to make and doesnt have much sugar! I ve done some of your fish recipes, I love fish, they were delicious , Ill send some pictures! Thanks Catherine and have a wonderful week!!! Thank you Maritza! I would pictures! It’s always so gratifying to see my recipes come to life in another kitchen! LOVE IT!! Im so exited, about all this Amazing Food Revolution ! Its time to wake up , to have a better health, eating a real food!! Maritza! I LOVE your enthusiasm!! You are so welcome! bonsoir , ça a l’air très bon et si facile à faire , je vais tester cette recette dès demain!! merci!! Merci Martine, j’espère que ça vous plaira! Donnez moi-z-en des nouvelles!! J’adore! Friends from Boston are coming to see my new house next weekend, and I’m putting these on the menu. I hope they’re suitably impressed! I bet they will be, Betsy! Have a wonderful housewarming weekend! Yay, I love the mousse so much too! It was really hard to pick! that not only looks delicious but also easy to make.i was woif you happen to have a mousse recipe without eggs as my oldest son is extremly allergic to eggs and peanuts?iwould be nice to offer him a similar dessert to what we are eating.thanks in advance. Thank you Karen! A mousse per se, unfortunately no, I don’t but I do have a lovely fig custard that your son may enjoy? I know it’s not chocolate and it’s not a mousse but, just maybe? that would be great.my son love figs.when we visit my in laws in the summer holidays they have a fig tree in their garden so he picks them fresh. Karen, that’s wonderful!! I’ll keep thinking about that question next time I create a mousse-like dessert, so keep checking from time to time, and of course I have a lot of other desserts that have neither peanuts nor eggs he may like!